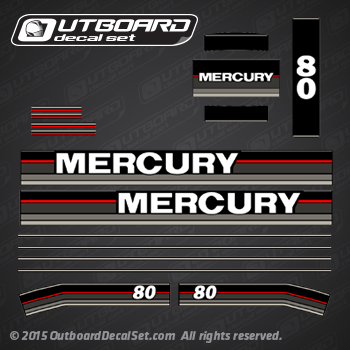 Mercury Outboard decals replica made for 1989 Mercury outboard 80 hp motor based on pictures, traces and measurements. 1989 MERCURY 80 hp ELO: 1080717 ELO, 1080312BD ELO, 1080312GD ELO. 1989 MERCURY 80 hp ELPTO: 1080412BC ELPTO, 1080412BD ELPTO, 1080412GC ELPTO, 1080412GD ELPTO, 1080727 ELPTO, 1080D12GD ELPTO.